Miami, since the start of the 21st century has become a top destination for global business. It is one of the world’s most desirable places not only to visit, but to live and conduct business. The developments, all distinguished by partnerships between renowned architects, interior designers and artists, resulting in awe-inspiring residential properties are recognized world-wide as urban masterpieces. Since 2010, the population of Greater Downtown Miami has increased more than 38 percent, with a population of 92,000 in 2018 and an expected population of over 109,000 by 2021. The majority of this population are highly educated, young working professionals who enjoy a live, work, play lifestyle. But look closer. Brickell has new opportunities on the rise. This area located roughly between I-95 and SW 1st Ave belongs to the Brickell area and is distinctive because of all the unique projects planned for completion in the next 10 years. Brickell is Miami’s most desired as well as it s fastest-growing neighbourhood, and accounts for 45 percent of Greater Downtown Miami’s population. The largest financial business district of the South East, with over 50 banks and institutional firms, Brickell is also known for its glamorous nightlife, retail and restaurants. In the last 25 years, over 50 glittering skyscrapers with luxury condos have emerged in Brickell. Aside from luxury condos and class-A office buildings, this area will additionally cater to the hospitality industry, with over 1,450 hotel rooms coming to the area by 2025. The area also has numerous pedestrian walkways and public transportation, making this area one of Miami’s most walkable neighborhoods, creating connectivity to all areas of Brickell and the rest of Greater Downtown. 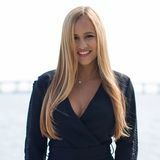 Walkable, Connected, Smart West Brickell is an outstanding location for investment. It is located only a block from the renowned Brickell City Centre and Mary Brickell Village, filled with retail shops, restaurants and night life. Habitat Group has focused its expertise in developing projects in West Brickell, as it is the next up-and-coming area of Brickell, with new condominium towers, hotels, residential rental buildings, and more, some which will be developed and delivered in the near future. Character Elegant and organic, its strong presence positions Brickell Lux as a powerful and poised statement for the Brickell skyline. Proudly situated next to Brickell City Centre, the extraordinary creative collaboration will result in an architectural paradigm for the city. With its sophisticated residences embodying nature, Brickell Lux will reinvent the classic Brickell Luxury residence, delivering a distinctive living experience. Lifestyle The mixed-use project will feature 108 residences, 60 hotel rooms and commercial space. 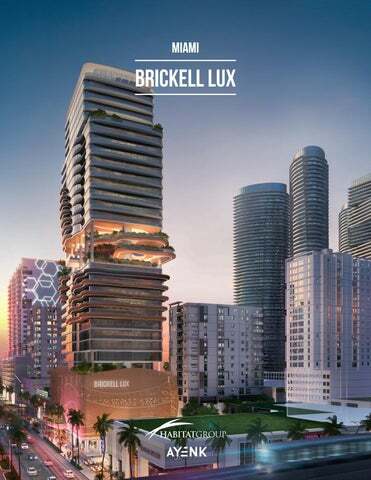 At Brickell Lux, residents will have ultimate access to an oasis of exclusive privileges. An exquisite and chic lobby, private amenities designed to indulge with sophisticated and elegant finishes throughout. Lobby & Commercial Being next to the Underline, Brickell City Centre, and Mary Brickell Village creates a unique opportunity for Brickell LUX to be highly visible and accessible by foot. Walkability creates the influx of the young, mobile, live-workplay oriented millennials. The ground and first floors of the building will provide 12,000 square feet of commercial and lobby spaces, surrounding the residents and visitors with retail excellence and unforgettable dining experience. Residential Brickell LUX features a new benchmark in Brickell's luxury residences, with spaces inspired by the live-work-play lifestyle. There are 108 residences with various layouts, ranging from standard apartments to penthouses with floor areas ranging from 800 to 1500 square feet. The residents will have access to outstanding amenities, such as a clubhouse, sky garden, green terraces, GYM, swimming pools, and elevated running tracks, restaurants, and bars. Hotel Brickell LUX embodies 60 hotel rooms that provide an ultimate urban experience for the residents. The excellent connectivity to the city via public transport and strategic location next to the Heart of Brickell and Metrorail makes it an attractive place to stay. The hotel lobby, parking spaces, and rooftop amenities are separated from the rest of the building, catering to the need for privacy of the guests. The rooftop amenities, pools, SPA, open-air bars provide a retreat to an urban sky oasis overlooking all of Brickell and Miami River. Parking Brickell LUX provides 180 parking spaces enclosed inside of a smart architectural skin designed for light and energy control. The beautiful organically shaped envelope creates a floating feel for the residents and hotel visitors. The experience is topped up by the rooftop pools, open-air bars, and lounges available for the guests.